Srpuls.CZ | VINYL DISK MUSICK [Interviews] ROOT "Talking about vinyls before their big tour"
>>> I n t e r v i e w s >>> ROOT "Talking about vinyls before their big tour"
ROOT "Talking about vinyls before their big tour"
Talking about vinyls with the leader of Root was not easy at all. Formerly he owned all Root vinyls but today he does not even have the first three LPs of his band... However he did not leave vinyls, he´s got all the new Root vinyl releases and that is why he commented them more than the older ones. But our interview is not purely about vinyls. We touched also the communist police, black markets with music, their first label Zeras, „mascot“ Rootan and not last Big Boss´s feelings before their big tour. Do you remember your very first LP record? What was it and do you still listen to it? It sounds as if you replaced vinyls for CDs, is that right? Have you ever been a vinyl collector? And when? Well, I was obsessed by buying LPs, I realy had a big collection, over a thousand... I was a completist, some bands I had complete, for example complete Queen discography on vinyls etc. Do you think that LP records are still actual today? I think that today it´s just a rarity for collectors... due to the space needed, due to the records player demands, service, you have to look for new stylus sometimes and I don´t know what else... I think that today´s generation does not care. It is connected to the consumerism of today. The vinyl is a kind of alternative... today you just download whatever you want directly to your PC while playing real records is a little ritual. But I think that many people have different attitude than you. For me, for example, it is no ritual to care for records, to clean them and so on. He, he, he. Sure, there is some nostalgia, but I am not a nostalgic person. So I dont care. Was it difficult to find a record in those times when you collected them? How the marked worked at that time? (a comment for foreing readers - under the communist regime it was not possible to buy legally stuff from not-communist countries, including music). For me it was not that difficult as my sister went often to Vienna, so I was the lucky one... and if she could not find something, the black flee markets were the solution. There you could find nearly whatever. Well, sometimes we were dispersed by the police, but they were not too active in this as they looked for records as well. He, he. For example you could order an LP there and within two weeks you got it (of course illegally). It costed arounf 300 - 400 Kčs while today some of them cost many times more. But it is not interesting for me, moreover without the record player... Ha, ha. Really, the delivery time was shorter than today. Ha, ha. On the other hand it was the only medium for music, regardless the commies. 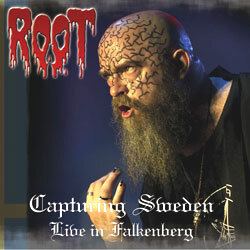 And honesly, you have to be pleased with the newly released Root vinyls, don´t you? The last one was the box set "Dema", how do you like it? Sure I like it. The American release is very nice, moreover there are two versions. The ordinary and cheaper on black vinyls and die hard version which is more expensive. I like it very much, of course. How did you get in touch with Nuclear War Now! Productions? This is not a question to me. Our bass player Igor cares about all these matters. He negotiates everything and then he informs me about the results or asks for my approval. I have no clue what, when, where, how... I am sorry, but I really cannot tell anything more. Let´s go to the vinyl beginnings of Root. 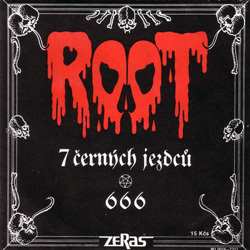 The first vinyl release was an 7" EP "7 černých jezdců" / "666". To release an EP, was it your idea or an idea of your label Zeras to check the interest? In those days, who cared about all those matter which are today managed by Igor? It was my idea and Zeras agreed. By the way, it was very successful, as well the debut LP. Today the Golden record award is given for 10.000 copies sold, so we would easily reached for it. Ha ha. It was also me who managed all the negotiations in the past. 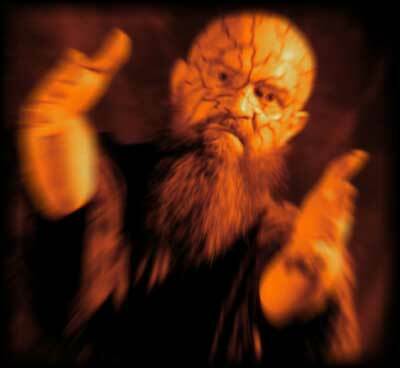 I was the band manager until it was taken over by Jaromír Tichý. And after he left it was me again... and as late as when Igor joined the band I slowly passed all these obligations to him. He´s a very powerful guy and moreover he enjoys it. The only thing I still do is negotiation with our label, our contracts and CD and DVD layout propositions which are then painted by Roman Kýbus. How did you get in touch with Zeras? Whose label it was and what are they doing today? Have it been the only offer you got or did you have more offers to choose from? Zeras was the first and only label releasing metal. Their first release was Törr. I got the contact to the label owner Zelenka from Vlasta Henych and I called him. He came to Brno and the negotiation started. It went all quite quickly and we signed. In fact, we became the first professional metal band here, as we got a regular salary (aside from money for live shows and records). But later the label had some financial difficulties and so our cooperation had to stop. I know that Zelenka was their manager and that I got in touch with him thanks to Törr. I think he released them something, but you have to ask them. Let´s turn our attention now to "Zjevení", your debut and your only album in Czech language. When it was released its price was 80 Kčs and thus it was the most expensive Czech record. I really was not sure if I want to invest those money... Today its price is many times higher, as you said. I think that for you it must be a satisfaction and longstanding evaluation of your past work, isn´t it? The question if you are pleased by this is useless, however I will ask if you would, from today´s point of view, change anything on this LP and why? I have sold my last next to that last copy of "Zjevení" for 100 euro and the guy came for it from Vienna! There is nothing I would change. What should it be? It is done exactly as we wished and there is nothing what I would change today. I really hate bands which say about their older records that now they would record it differently etc... If the record is mine, then it is mine forever, am I right? Franta is a genius! After all, he is a graphic designer and an autor of many fonts with an international reputation. What more to add? You´re right. This is pretty known fact. 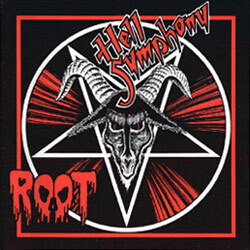 But when speaking about your inlays, the one of "Hell Symphony" seems to be qualitatively far from the first one. Was it a purpose? And who was the author? Qualitatively far? I like it, all the album is about Hell and the front cover perfectly fits. But I alredy have no clue who was the author and how the inlay looks like. That´s what I was speaking about... the inlay. I don´t have it. 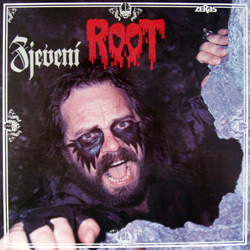 I don´t have any Root vinyls so the discussion is meaningless. I only have those Root vinyls released today. But not the first three albums. There was a big pentagram on the LP and you started to use English language instead the Czech one. I´d like to ask - where Rootan had disappeared? His name is today used on your web domain and he was the centre of most of your older lyrics. You have not understood who was Rootan? I think I have, but it was never explained explicitly. In my opinion the second albums did not have such a strong promotion as it would need. Did it sell worse, if you compare it with "Zjevení"? Zeras was already in financial difficulties, am I right? Yes, the were early at the end.... What more to say? 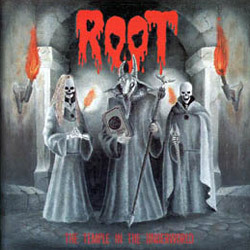 The third album "The Temple In The Underworld" is in my opinion the top of Root discography (without challenging the quality of all the preceding and all the following albums). The album was released by Monitor. Have you been satisfied with their promotion? Can you compare their attitude with the one of Zeras? I think it was on the same level. Monitor was not such a big label as today (its name was not Monitor/EMI yet). But not even today Monitor promotes anything too actively. So I think that they are still the same, in the past and today. After 11 years without vinyl release you appeared on a 7" split EP with Atomizer. Your track was entitled "Ancient Mysteries". It is not the most typical Root song? How was it created? Have you composed it exclusively for this 7 inch? Then you got an offer from Monster Nation and your sixth album "Black Seal" (only "Kärgeräs" and "The Book" do not exist on vinyl) was released as a doubleLP. Today it is sold out. We can already talk about the covers, right? About the covers? Yes, we can as I have them at home. Ha ha. 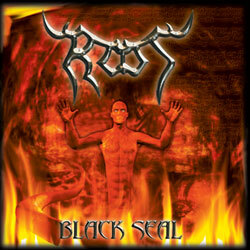 The cover of "Black Seal" was painted by an American painter Seth Haymon. Have you chosen somethign from his „catalogue“ or did he work for your order? I know you got in touch via internet. Who was the first to contact the other? Seth ICQed me as a Root fan. I had no clue he´s a painter and he plays in some band... nothing. After a month or so he wrote me to looked at some of his pictures. I like them very much and so I asked him to paint something for Root. Then we emailed very frequently and dicussed the details and the result you can see on the "Black Seal"... The body should have been little bigger, but who cares. It´s perfect as it is. On the CD cover it is too small, yes. But on the LP it is OK. He, he. Man, you guess right. Of course we have a chronicle. It´s a huge book, including old photos from the beginnings, letters from other bands from all over the world, from Guns´n´Roses, King Diamond... But after we released our first album, we stopped writting it and since than noone of us wished to continue. 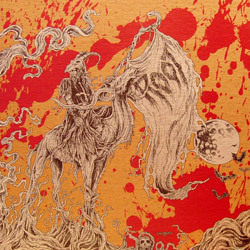 After "Black Seal" there was the "Madness Of The Graves" and the cover artwork is painted by Deather. It is his second artwork you used. The first one appeared in "The Book". Did you tell him your ideas or have you chosen from pictures already done? How is it to cooperate with him? All the covers follow my ideas which I create according to my lyrics. So I told to Deather how it should look like and he just started. The cooperation? Few times I visited him at home to check some of his paintings... and we got drunk a lot. Ha ha ha. But the cover of "Madness Of The Graves" is not the best one. It did not come right. It is little inexpressive. The colour is terrible and it´s bad in general. But there were certain circumstances around the band so we have left it as it was. I would not like to speak about the details... I am lucky it´s over. This is perhaps the only thing in Root history which I am not satisfied with. But as I said, it´s over. And the most actual vinyl is the DLP "Capturing Sweeden - Live In Falkenberg". The cover contains (after a long time) again the old bloody logo. Why did you leave it after your third album? And who is the author of the old and of the new Root logo? The author of the very first logo is Blackie. Then it was slightly adjusted by Franta Štorm, then again by Blackie... So we have three official logos and we use all of them, depending on the total appearance of the records cover. I don´t think that the logo is that important to remains all the time the same. On the other hand, the important is to maintain the original form and the idea of the logo. I have to say that most of todays band I am not able to recognize according to their logos. It´s a shame, because many times you even don´t know what band it is playing... if it´s a new band. Did you know it before that Swedish gig that it will be recorded? Or was it a chance and the quality of the recording was such high that you wished to release it as a live album? And what was your strongest experience in Sweden? No, we played it as any other show. I had no clue that it will be recorded. And I can tell you, when the tape with that show appeared, I don´t know who recorded it... Moreover, I have never heard it, as I don´t have a record player, as you already know. In Sweden we feel to be as at home. But what I was amazed was the cleanness. Cleanness of the streets and of everything around. When I smoked a cigarette I could not throw off the but. I would feel very painful to throw it off just on the floor. At the end I throwed it to the river... The fans there are amazing and they know our music very well so the shows are always perfect... I like that country. 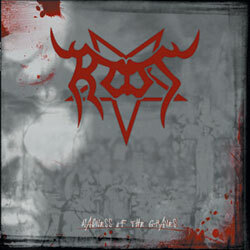 This title is not included in Root discography on your web. Why? Is it due to the lack of time or do you assume it to be a kind of a rarity? The same question can be asked also about the box set "Dema". OK, let´s talk about you latest vinyl release - the luxurious box set "Dema": 2 x double LP, t-shirt, history, briefly - excellent effort! Which version do you have at home: the die hard one or the one for common deadly people? Do you like it or is there anything you would prefere to be done better? Of course I have the „die hard“... And I like it very much! As far as I know, you prepare for your first really big European tour. What are you trying to improve most? Well, to be honest, I am very scared of it. You know, my health is not the best already and if I imagine some 15 nights in the bus (well, a luxurious one, but still in the bus) I am not sure if I survive it. I think the No Mercy tour is (aside from the new vinyls) for you another satisfaction, as you have been very underrated for a certain period. And I still your career is far from being over... Am I right or you don´t care about these problems? You are right... I don´t care. Ha ha. Of course it´s a dream which was fulfilled. Now it´s up to us what we decide to do on. In a way, this is a ticket to the top and we are alredy contacted by gig organizators from all the world. Maybe I am the one who brakes the band - because of my health. You know, I am 55 and I don´t withstand what I was used to. I have drunk all my life and now it seems I am getting the bill. Well, let´s try it and we´ll see. Maybe everything wil turn in a different way. Ha, ha. This interview will be called "Talking about vinyls before their big tour". Do you want to close it somehow? For example by the same words as The Temple LP ends? Oh, I have no clue what is at the end of that LP. But in principle, I never close anything. It would be a grave. So let´s leave everything open and I wish to all your readers a lot of good music and pleasant reading. And thank you for the interview. Thanks to you, too. 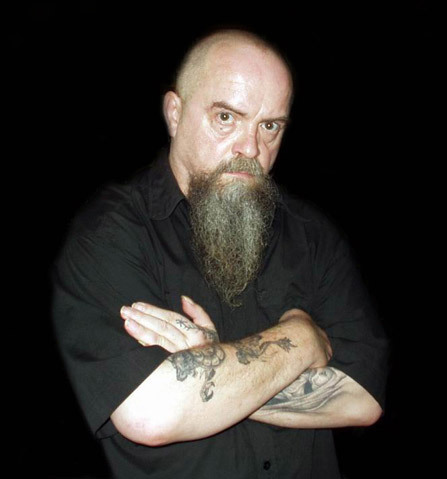 And I wish you at least twenty more years of active music, big boss of Czech black metal. Note: The interview was done via emails during February and March 2007. 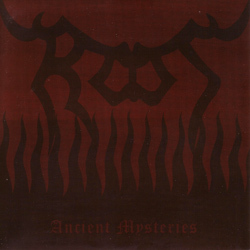 ROOT "7 černých jezdců" / "666"
sampler DEATH METAL SESSION: skladba "Hřbitov"
ROOT "Ancient Mysteries" | ATOMIZER "And The Hunt Starts Again"
ROOT "Madness Of The Graves"